The English theologian Nicholas Lash once noted that people are not saved from drowning by thinking differently about the law of gravity. Their lives are saved by a change in action. In reflection on the future of our parishes, a change of approach to evangelisation at the grassroots is critical if these communities are not to become relics of a life once lived. Sadly too many parishes today rely on a ‘come and see’ approach to evangelisation that has not proven particularly effective and may even reflect a passivity in regards to mission. There is a need for a change in intent, a renewed commitment to ‘go and tell’ in the everyday conditions of our life. Working with parish pastoral councils and ministry groups in the past months, I’ve shared some of the following insights as a means of provoking conversation and clarifying intent among parish leaders in their outreach. In any given parish there is a small core group of dedicated members who attend Mass, serve through various forms of ministry and parish leadership, take part in occasional opportunities for formation and are generally committed to developing their faith and understanding. Then, there is a larger group of Catholics who attend Mass regularly but go no further. 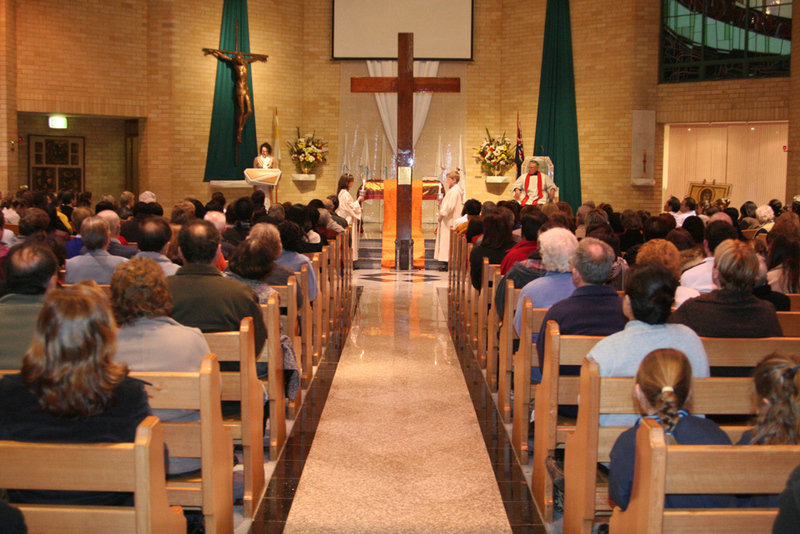 The last cohort within the parish is much, much larger, around 90% of all Catholics who live within the parish boundaries, who do not join us for worship and are distant or else disconnected from the faith. It is this third group, baptised Catholics who no longer connect with what is going on in our parishes, which presents as a starting point for a renewed evangelisation. The question is how do we reach this large number of non-attending Catholics, those who could be described, for convenience sake, as the ‘unchurched’? From experience, parish responses to the unchurched tend to be limited to letter box drops or advertising Mass times in the local paper, initiatives which are not bad in themselves but can reflect a rather skewed imagination about what is keeping people away. To sharpen the point, non-practicing Catholics are not staying away from our pews because they don’t know what time Mass is on! They are missing from our pews because they don’t see the point in being there or have no sense of what the community is about or where it is going. Evangelisation in the wider community cannot be limited to the dissemination of Mass times and impersonal mail campaigns. Our efforts must be person-centred and relational, an insight that is not unique to Pope Francis but certainly brought to fresh attention by his leadership. The first step toward renewal is to recognise that the unchurched we seek to reach for Christ are not strangers ‘out there’ nor are they statistics without names or faces. The unchurched are in our homes, sitting at the dinner tables of practicing Catholics! They are our relatives, friends, and neighbours who identify as ‘Catholic’ in some way but do not participate in regular worship or intentional acts of Christian service. It follows that reaching the unchurched is a matter of skilling and empowering practicing Catholics to start the conversation about faith with relatives, friends and neighbours. Unfortunately, resources and practical assistance to prepare our people for this task is rarely found in our parishes. It is worth noting that some Baptist communities offer workshops to support wives in faith-filled conversations and relationships with their husbands who are often less likely to attend a weekend service. It recognises that evangelisation takes place via relationships and via the bridges of credibility in our lives. Parishes might also offer their parishioners personalised invitations, prayer cards and expressions of support to family members or connections at critical times in their lives. Prayer and faith resources that support people in times of distress, in times of life transition (e.g. retirement or new parenting) and times of joy can also form a bridge between faith and life. Welcome teams, ministry groups and others can be readied to offer particular hospitality and friendship to relatives and friends who take up the offer to join us this Easter or Christmas. While such initiatives of evangelisation can sound a little provincial or homespun, grassroots efforts such as these can make an enormous difference. It locates or embeds the mission of evangelisation in the relationships that already exist between the unchurched and practicing Catholics. Ultimately, it is not good policy or strategies that make disciples. Disciples make disciples. We need to form practicing members of our Church to have the confidence in faith, skills and relational sensitivity to reach out to those they know and love with the Good News of the Gospel. Another measure by which we focus on the unchurched is to pray that the outreach of the parish will be effective. Prayer brings us to what is most important to us in our life of faith. Praying for the parish mission to be effective, praying that members will reach out to others with joy, praying that relationships will be transformative, places our efforts to evangelise in the heart and hands of God and in the heart and hands of the worshipping community. A parish that is not praying for new members, that does not explicitly name those who the parish is trying to reach for Christ, can be reasonably questioned on the seriousness of its intent. On the inside of our church doors, an evangelising parish will also think through all that the parish does through the lens of an ‘outsider’, not through the experience of an ‘insider’. As an example, parishes can often assume they are welcoming and friendly because they think in terms of how existing members treat one another, not how outsiders experience the parish. Some of the most self-identifying ‘welcoming’ parishes and dioceses I have visited barely register the presence of newcomers in their midst. On the flipside, we know that when visiting a parish other than our own, a gesture of welcome or personal recognition by others can be extremely touching and can encourage longer term commitment. ‘Insider’ thinking can also be reflected in a lack of signage in many of our parishes. It is not only the local delivery man who can find it difficult to find the parish office but first time visitors as well. Good signage reduces the need for insider information. 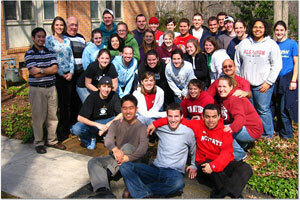 The fewer blockages to participation in, and acquaintance with, a community of faith the better. Evangelising parishes also have mission statements, that is, they have reflected on, defined and articulated their identity and mission in the local community. I recall a priest who commented on the utter uselessness of mission statements. Of course, he is right – they are useless unless they are something other than a ten year old paragraph in an unread parish bulletin. A parish mission statement, as a guiding announcement or expression of Christian intent, will be valuable to the extent that it is understood, given commitment and lived by the whole community of faith. Sadly, many of our parishes lack a clear sense of self-identity and purpose. Of course, having a strong and defined home of one’s own can lead to selfish exclusiveness, as Pope Francis has warned, but having a home built on clear foundations and direction can also enable us to offer a home to others. What are our parishes about and what is their vision or aspiration for the years to come? Evangelising parishes pray about their mission but they also talk and communicate about their mission. Parishes that neither pray nor talk about their God-given purpose, their existence for others – including the unchurched and people of no faith – are unlikely to mobilise anyone out of the pews. It is impossible to persevere in a fervent evangelisation unless we are convinced from personal experience that it is not the same thing to have known Jesus as not to have known him, not the same thing to walk with him as to walk blindly, not the same thing to hear his word as not to know it, and not the same thing to contemplate him, to worship him, to find our peace in him, as not to. It is not the same thing to try to build the world with his Gospel as to try to do so by our own lights. We know well that with Jesus life becomes richer and that with him it is easier to find meaning in everything. This is why we evangelise (Evangelii Gaudium 266). It is the call of practicing Catholics, all of us in our local parishes, to first know the difference that Christ has made in our lives before moving out into the fields of relationships and networks that form our mission field. It is in our homes and everyday lives that the Gospel must come to life for the sake of the world. It is in this context that we need to form intentional and missionary disciples. You have run through the expereinces of many (I am sure) of us. I have belonged to/worked in 4 parishes. Welcomers are good and I belonged to a roster of people followingup the welcome, and surprisingly this was often not received positively by the visitor. It takes 2 to engage! 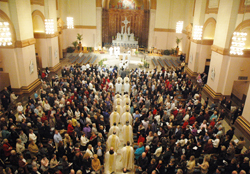 The best way to immerse in a parish is to join a parish apostolate of some kind. Then relationships are not superficial but are strong enough to tie the person to the parish and gradually they get to meet others. Dont want to reflect backwards too much here but decades ago, this laity-driven system was in place and it was deliberately dismantled as a clerical policy (but we wont go there). Now it is recognised with the multi ethnic composition of our parishes, enmeshing in a parish is harder IF you dont link up for a purpose-apostolate. Belonging to a busy family as I do, where employed people are so often overworked, they are not looking for any extra work commitiments and just want to find some space to unwind before Monday rolls around again. Technology (iphones) are not facilitating close relationships, but working against building up community. Recently the NeoCats did a doorknock around our Parish with a plan to set up a fledgling Neocat community. They certainly knocked 200 or more doors and did not come back with any ‘bites’. I dont want to sound all doom and gloom because I dont live doom and gloom. Talking to the unchurched in our own homes is the hardest apostolate I know; disenchanted brothers and sisters are going to let you know why way before you let them know that you are still a Happy Catholic! It is always a veritable incoherent stormcloud of emotion about something that happened in their youth or whatever! They have no intention of actually discussing the detail of their complaint. The emotion aspect is just an advertisment to “Keep Out”! I have been a part of many apostolates but am anchored in just one in particular. In my time at RCIA, there was an underutilisation of this great apostolate = it wasnt done well – as there was no attempt to use the months of meetings to form broader relationships with other parishioners who were not themselves part of RCIA. It is a bit like trout farms, where you grow them till you think they can swim, then release them into a sea of strangers! Any attempt by someone (read me here) to change the way it was done, was met with indignation. I think it is a case of ‘carpe diem’ – seize whatever opportunities you are staring in the face! Push yourself if you are willing to the enth degree to do whatever good you can. Because of aging parishes, older people’s ways of relating are going to be social predominantly and that is ok. But of course we need a middle block with incentive, love of God, and time to commit. Jesus would not have said “Pray the Father to send workers into the field; the workers are few but the harvest is large”. I guess He always knew it would be a bit like this. This is not a slam the door post Daniel! I subscribed to hear your thoughts and ideas because I intend to use them. Best wishes. Hi Louise, thank you for your comments and observations! You have your feet on the ground and are sharing some very real challenges at the grassroots of parish life. Thank you for making this conversation real for us. I would agree with you that the ‘doorknock’ approach is not often received well and small groups, with a purpose or apostolate as you say is a more effective way to draw people into the heart of the Church. It is interesting to note that in Australia practicing Catholics rate ‘community life’ as their highest valued aspect of Church life , and yet rate ‘small groups’ and ‘reaching out to others’ at the very bottom of their list. And yet it is by small groups and evangelisation that people are drawn into community life! Many of us came into the heart of the Church through a small group, a youth group or prayer group or similar, so I do think this is one of the key areas where we need to work on as parishes. I remember someone sharing that small groups are not small because they take a lot of work and commitment, and the right facilitators and resources, to get right. Too often a parish priest will begin a small group, leave it to its own devices, and it does not last the distance or grow as a group. Small groups demand a lot of work but is one thing we can shape as communities of faith. As for spreading the Good News in our homes, I agree with you that this is the most challenging field of mission many of us will ever encounter, complete with the ‘stormcloud of emotions’ and acrimony you mention. I suppose I wanted to raise this very domestic and intimate issue because U.S. research notes that almost 72% of all Catholic converts (about 1.9. million American Catholic converts) identified marriage as an important reason for their switch in faith. I also know how hard Baptist communities work at resourcing wives and husbands in sharing their faith with their spouses, and they are quite successful in getting these spouses involved in the community.